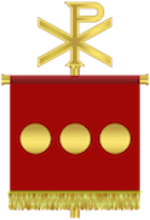 The first public use of the Chi Rho symbol was on the labarum, the shield of Constantine’s warriors in the Battle of Milvian Bridge on October 28, 213 AD. Emperor Constantine (reigned 306-337) and his troops saw a miraculous sign in the sky the day before the battle. 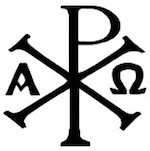 Emperor Constantine won the Battle of Milvian Bridge and believed he won because of the symbol of Christ, the Chi Rho, upon the shields of his men. Several months later, Constantine in the Edit of Milan declared Christianity legal in the Roman Empire. The almost three hundred years of Imperial Persecution against Christians were over.